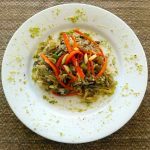 Although this is not the first rice pilaf recipe we publish on 196 flavors, plov is Uzbekistan’s national dish and there was no way we could skip this institution. Pilaf (or pilav, pilau, plov, pulao, polu and palaw) is a rice dish that is cooked in a broth. 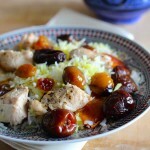 Depending on its origin, rice pilaf can be accompanied with meat, fish, vegetables, dried fruits or nuts. This method of cooking rice is widespread across the globe, and has often been featured on 196 flavors. 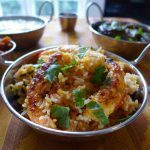 It is found in many typical recipes in the Balkans, Middle East (al kabsa from Saudi Arabia or majboos from Oman), Latin America and the Caribbean (arroz con bacalao from Panama, cod blaff with rice pilaf from St Vincent and the Grenadines, locrio from Dominican Republic) and Asia with Indian biryanis). 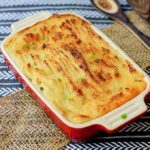 What is the origin of pilaf? One of the earliest references of pilaf dates back to the time of Alexander the Great in the 3rd century BC. When he visited the province of Bactria (Eastern Iran), he was served pilaf at a royal banquet. It is said that the soldiers of Alexander the Great then brought the method of preparation of pilaf to Macedonia, and this method then spread out throughout Greece. The first person who documented the modern preparation method of rice pilaf was a Persian scholar known by the name of Abu Ali Ibn Sina (Avicenna). 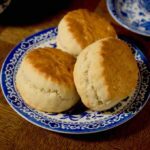 He used to include recipes in his medical books in the tenth century of our era. Uzbeks and Tajiks consider Ibn Sina as the father of modern pilaf. 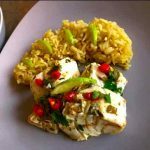 Since then, rice pilaf has spread across the Middle East and has been adapted by the Persians, Arabs, Turks and Armenians. It was introduced in Israel by Bukharan Jews and Persian Jews. The Central Asian country of Uzbekistan has long been part of the Persian Empire. It was subsequently incorporated into the Russian Empire until its independence in 1991. The 30 million people in the country speak Uzbek, which like Azerbaijani and Kazakh are part of the Turkic languages. These colonizations have obviously influenced Uzbek cuisine. 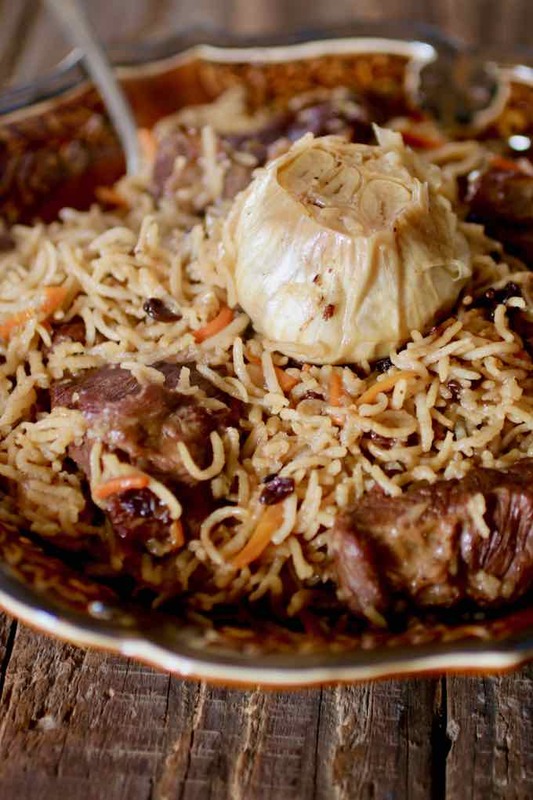 Uzbek plov differs from other preparations in that rice is simmered in a broth of meat and vegetables called zirvak until the liquid evaporates. 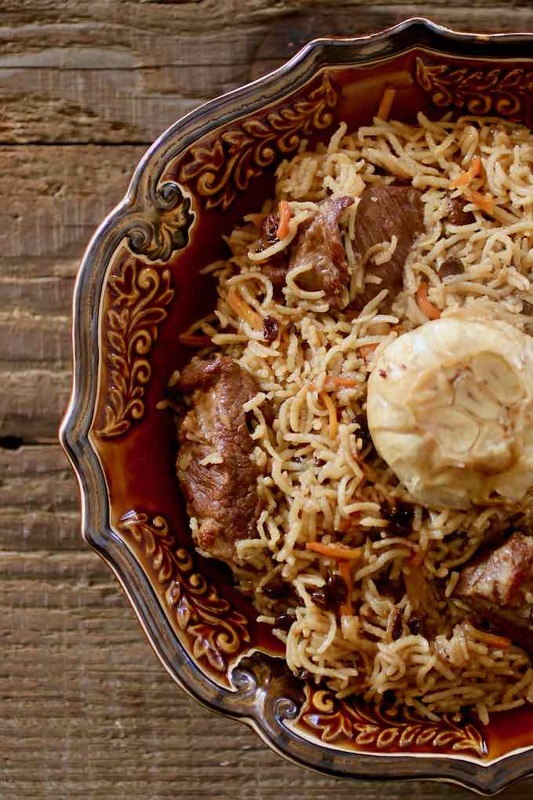 The most common variants are the plov with lamb or mutton, while the chicken plov is most popular in the region of Bukhara. In Tashkent, yellow carrots replace orange carrots. 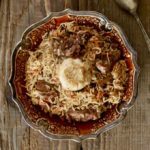 Some ingredients make this plov recipe a little different from other pilaf recipes, such as the addition of barberries also called berberis in Arabic or zereshk in Persian. Also, the addition of chickpeas (optional) provides additional some delicious richness to the plov. Uzbek plov is traditionally cooked in a kazan, a sort of large cast iron pot, over an open fire, but cooking in a dutch oven over a gas flame will work just fine. Also, it is possible to save time by cooking the meat first in a pressure cooker before incorporating it in the plov dish. Plov was a huge hit at home. This rice pilaf dish will probably make it to my top 10 recipes of our first world tour. 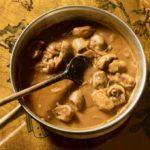 It is quite easy to prepare and includes everything to make it a rich and nutritional dish (meat, vegetables, dried fruits, rice). A must! 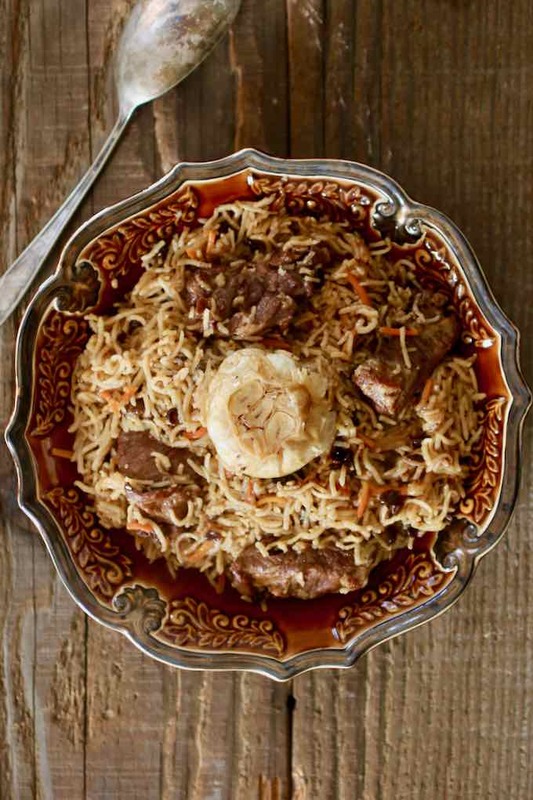 Uzbek plov differs from other preparations in that rice is simmered in a broth of meat and vegetables called zirvak until the liquid evaporates. Place the basmati rice in a large bowl and cover with hot water. Set aside. Wash the garlic heads. Cut the top of the heads (¼ inch). Set aside. Toast cumin, coriander seeds and peppercorns in a pan for a few minutes. Grind in a mortar or spice grinder. Set aside. Heat oil in a pan over high heat. Add the lamb, turning occasionally until the lamb is evenly browned, about 10 minutes. Remove the lamb pieces and set aside. Stir in onions and cook, until onion is soft and golden, about 10 minutes. Stir in carrots and cook, until carrots are tender, about 10 minutes. Add the lamb and mix. Sprinkle the mixture of cumin, coriander, peppercorns and add the barberries. Add the whole garlic heads, stirring to distribute the ingredients. Reduce heat to medium. Cover and cook for 30 minutes. Wash and drain the basmati rice in hot water. Pour the rice over the lamb mixture in an even layer. Slowly pour the boiling water (or vegetable broth). The rice should be covered with about ½ inch of water. Do not stir. Season with salt and reduce heat to medium-low. Cover and cook until rice is tender and liquid has been absorbed, about 20 minutes. Mix the ingredients as you serve the dish on a platter. Garnish with the garlic heads. 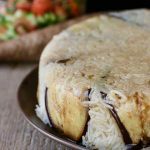 I vote for this one because, its easy to make and I love rice Pilaf and adding the dried fruit and meat to it makes it sound delicious! It is a well rounded meal. This was way beyond just good and one of the best rice dishes that I have ever eaten. I made lamb, bison and chicken versions and the only complaint that I had was from my Mom who was miffed that I didn’t do a Vegetarian rendition (as she ate some of the 3 versions I made). 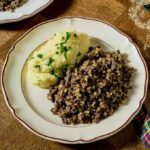 This recipe is a total keeper as is and needs no other tweeks or other changes. Thanks so much Brandon! I am so glad it was a hit. I have to say I really loved this dish myself. Actually had the real deal at an Uzbek restaurant in Manhattan last year. Delish! I’ve had the great Fortune of eating lamb plov made with adziks in it (awesome stuff from gruzija/Georgia republic) cooked by the gruzini ppl themselves on site at the Riga Central market, a huge open air and in old hangars in Riga, the capitol city of LATVIA, and boy did that stuff ROCK! 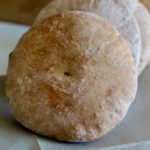 I make it at home all the time now the Georgian/gruzini way as part of our Easter celebration every year!!! Mmmmm! 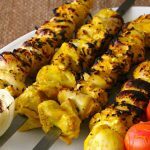 Thanks for sharing this amazing and authentic recipe, I am the biggest fun of Pilaw, and I have traveled to Uzbekistan, Tajekistan and Afghanistan where Abu Ali Sena is from and the Afghan version is called Qabeli Palaw. Thank you so much for the kind words, Khalid! This is a lovely meal that have had cooked for me by a kazahak! what can be used as a substitute for barberries if you cannot get them? cranberries? Sure Ian. 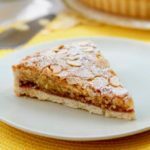 You can try cranberries or sultanas.